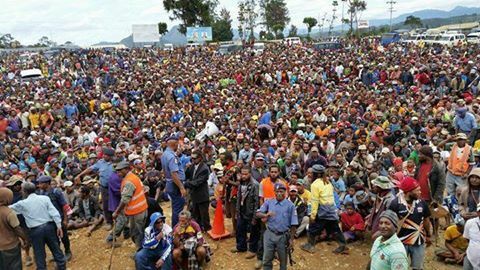 Two open members for Hela Province have thrown their total support at the back of Governor Anderson Pawa Agiru in front of more than 1 000 crowds in the heart of Tari Town today. This happened in the midst of political tussle arising from on the bail prisoner and Komo-Magarima MP Francis Potape and his troops, mostly LLG presidents to oust the sitting governor Anderson Pawa Agiru. The MPs are Finance Minister and Leader of Government Businesses Hon James Marape, Tari-Pori MP and Hon Philip Undialu, Koroba-Kopiago MP. In one of the most entertaining welcome, Marape told the packed crowds that he still support Agiru despite what is going on. He said 2017 is the right time to play the game and not now. Undialu also shared similar sentiments and urged his LLG presidents to reconsider their decision and work as a team. He said it is evil that is trying to bring disunity to Hela political leaders and make people suffer. The governor started his introductory speech by saying, “my name is Anderson Pawa Agiru, the governor of Hela Province.” This steered up the crowds. Some even crawled on the gravel and removed their shirts. Marape and Agiru also announced several projects like UPNG Open Center, roads and switching on of electricity which they will launch or them tomorrow and onwards. Also attending this event were Hela Provincial Administrator William Bando, incoming PPC, CIS Chief Superintendent in Hela, LLG presidents and other high profile sons of Hela.